I’ve been reading Jay Hasbrouck’s Ethnographic Thinking this spring, sneaking its pages into gaps in my daily routines. It’s part of my longer-term project of reading across the fields of service design, design anthropology, and applied research over the last few years. I’m doing this reading survey at a time when practices, fields, and disciplines are converging, when design thinking, service design, and innovation are democratizing or—depending on your perspective—reifying and commodifying professions and practices that were once the domains of specialist practitioners. Interdisciplinary groups and teams within and among organizations are being assembled to tackle complex corporate and societal challenges. And these assemblages bring together constellations of stakeholders from industry, government, and other sponsoring organizations. In workplaces, labs and think tanks, there’s a growing effort to develop products and services in collaboration with the people who will use them. Hasbrouck’s concept shares with design thinking a mission to be accessible to non-specialists. Likewise, his book offers readers of any background “ways to think like an anthropologist” without, of course, being one. For Hasbrouck, ethnographic thinking is a learnable “mindset”, currently a de rigueur concept thanks in large part to the popularity Carol Dweck’s research on growth mindset and fixed mindset in developmental psychology. He devotes the book to explaining the elements of ethnographic thinking and building a framework for integrating ethnography into innovation projects. By contrast, Hasbrouck urges ethnographic thinkers to deploy the “greatest critical assets of contemporary ethnographic thinking: relativism, interpretation, deconstruction, and reflexivity” (p. 4). This advice isn’t just abstract. Ethnographic Thinking intends to offer concrete insights on the dynamics of ethnographers’ behaviours and their interactions with research participants in the field, collaborators on team projects, and clients, stakeholders and decision-makers within partner organizations. Each chapter follows a pattern: 1. field work story; 2. patterns and concepts; 3. broader strategic value. Within that structure, the content remains open-ended enough for readers to appreciate the variety, complexity, and challenge of ethnographic research. Thanks to just enough anthropological theory, methodology, ethics, and history, Hasbrouck’s stories go beyond war stories about fieldwork or consulting gigs. Whether he’s describing how he found a shoe hotel in Tokyo or his experience convening a complex interdisciplinary team to analyze the root dynamics of overfishing, his stories of both successes and failures illustrate key approaches and skills. They also demonstrate that ethnographic thinking must be learned, practiced, and refined. To learn to think ethnographically, one must act ethnographically, and Hasbrouck argues that both these capabilities can be learned and developed over time. They can also be done anywhere. As Anna Zavyalova has written, “the ‘ethnographic gaze’ is not a ‘cap’ we put on and take off again; it becomes a second skin, an augmented vision that changes the way we perceive our surroundings and actions of people around us—as well as our own.” Ethnographic Thinking offers examples of different settings and forms of ethnographic learning. For example, attending to cues during ethnographic interviews with research participants in their homes and workplaces enables open-mindedness and curiosity. Strategic wandering and interactions in complex cosmopolitan commerce-scapes reveal alternative product and service roles and value propositions for corporations to consider. Immersive participant-observation and interaction with people and communities offers opportunities for critical self-reflection and reflexivity. He also draws frequent analogies to different perspectives and professional lenses that ethnographers may adopt: a child learning (p. 4), an apprentice (p. 12), a detective (p. 19), a hostage negotiator (p. 38), a diplomat (p. 63), an attorney (p. 69). These systematic details are particularly helpful to readers who are new to ethnography or who want to expand their practice beyond the narrow, formulaic methods that have become popularized in some organizations. 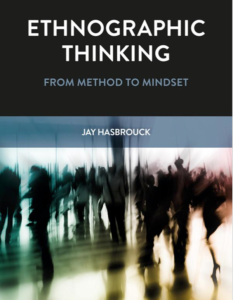 Ethnographic Thinking is an accessible and important pathway into ethnographic thinking, but Hasbrouck isn’t selling a quick fix or a boot camp. He kickstarts the kind of learning that happens through intentional participation and immersion in field and corporate project work over the span of a career. He challenges readers to adopt a learning mindset, including concrete practices for cultivating this mindset in the longue durée, and examples of the powerful strategic outcomes of ethnographic thinking that justify the effort. A key theme throughout the book is asking and prompting organizations to consider difficult questions. People thinking ethnographically must create opportunities to pose challenging questions that not only advance efforts to explore a problem space and develop possible solutions, but also to change relations between organizations and their stakeholders. Sam Ladner has written about ethnographers as “purveyors of what anthropologist Elizabeth Colson called ‘uncomfortable knowledge,’ or the discovery of knowledge that contradicts, threatens, or otherwise challenges established belief systems.” In a similar vein, Hasbrouck summarizes the power of an ethnographer asking “uncomfortable questions” that, “if carefully timed, carefully situated, and culturally attuned, are one of the most effective means of helping organizations reframe challenges, break down silos, and disrupt assumptions” (p. 85). Ethnographic Thinking fills an important gap in the literature because, although service design and design thinking have foregrounded “user” or “customer” experiences, their focus has been on individuals in relatively narrow contexts and their research methods often lack rigor. But the goal isn’t to replace design thinking. Hasbrouck argues, “the benefits of ethnographic thinking run parallel to those that design thinking brings to bear. While design thinking offers an iterative and abductive approach, ethnographic thinking introduces holistic, dynamic, and interpretive positions. The two should ideally complement one another” (pp. 104–105). Ethnographic thinking properly practiced can transform relations between organizations, their stakeholders, and their customers, as well as transform organizations themselves. 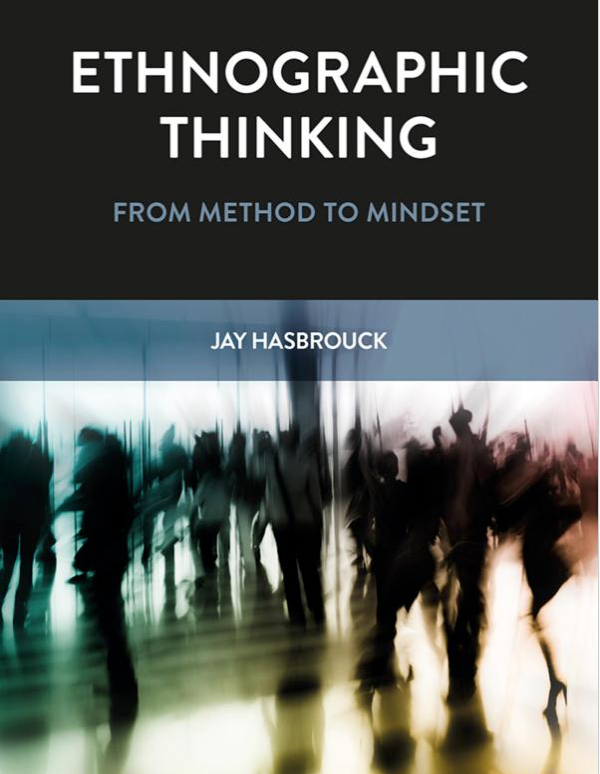 Hasbrouck presents an approach to stakeholder analysis that applies the aspects of ethnographic thinking he develops throughout the book and offers a practical framework for multi-sided engagement with cultures. For me, Hasbrouck’s explanation of holistic perspectives on innovation and his clarification of the relationship between design thinking and ethnographic thinking are the most valuable contributions of his excellent book to applied ethnography. Listen to an interview with Jay Hasbrouck about Ethnographic Thinking on the podcast This is HCD. David Rubeli is an educational consultant, certified leadership coach, and founder of Precipitate Studio, a research and learning consultancy in Vancouver, Canada. David’s research interests include learning and education, consumer researcher, creative teaming, design anthropology, design for services, and service innovation. Academically trained in English literature, geography, and adult and higher education, David coaches and collaborates with people to precipitate change by experimenting with and embracing deep and situated approaches to learning. Connect with David on Twitter and LinkedIn.